Great tips for vintage shopping, and I do the exact same things as you (running your hand over the rail to feel fabrics)! It definitely works and saves a lot of time too. I love your photos, and your writing as well, such a great blog! Amazing! I love them. You look gorgeous. Love the bow and the second sweater!! love that your dad takes your pictures. he must be so proud he has such a lovely girl :) also, i agree, you never know what you can find in the men's section!! Just gorgeous hun you look so sweet! Check out my lates blog post! Ive featured your blog as one of my favourite blogs and have posted a link to your blog! Feel free to post a link back to my site!! I lovee the seond outfit. Lovely pictures! You look like a little present! Love comfy cable knit sweaters. I love charity shopping as well! It is just a much more creative way to spend your money. I recntly came across an oversized orange jumper in a charity shop, it was a great find! what beautiful photographs. I love the outfits too. Great ideas for looking stylish when it gets cold. I really love the second outfit, especially the jumper. Oh I love your outfits and your photos - great poses!!! And a beautiful setting as well. looove your big bow. and that furry hat! must be super cozy under there. 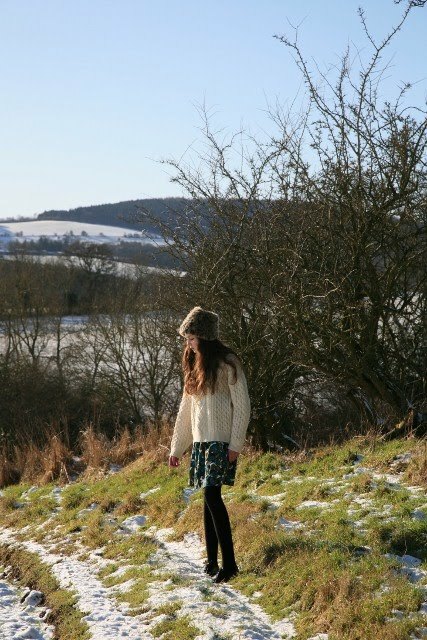 I love the cream knit with the floral skirt, its a very cute combination, especially with your charity shop find hat. I've never been a fan of pink, but you've styled it really well with the bow and the houndstooth skirt. Top marks again to your dad for the lovely photos. Yet again another great post. Keep it up! You look fantastic in every picture you take! The belt in the first outfit is gorgeous! Very feminine and lovely! It's my first time on my blog! You have such a lovely style! I love the bow in this look! Gorgeous photos. Both outfits are FABULOUS!! I love love the one with the black big bow! awesome! oh wow I am in love with that outfit ^_^ tres chic , ciao ciao ! Woww I've been a follower of your blog for a while now and you've taught me a lot! Gorgeous negative skirt. And your last post was so true. I love debating by the way and think that would be a wonderful topic. See? These two looks are exactly what I'd like to see everyone wearing now - and yet I can't seem to find it on the street. Can you pop down to London in either of these outfits please? I'm seeing hints of it.. would love to do a post on it but I can't find a way to illustrate it. Hey! Can I 'borrow' a shot (& link) as an illustration? I always love pale ballerina pink - like you, go thru stages where I don't wear it for a while - but still love it, esp with black or b&w. (the top shot is my favourite). And the 2nd look: jumper with flowered skirt, tights, and brogues.. the perfect way to ease into spring & still stay warm. i love your sense of style. It's so refreshing! Very interesting vintage hunting tips! I have been catching up on your posts....you have the most delightful collections of hats! Gorgeous! fur hats forever!!! lvoe this post, you are lovely as usual, and I adore your cozy ensemble!